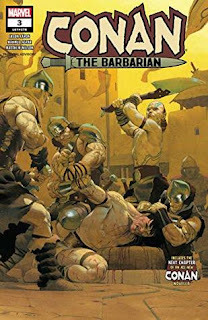 Conan The Barbarian (2019-) #3: In this third installment, we have Conan at a third location and adventure. We also have a third installment of John C. Hocking's "Black Starlight" novelette, itself an entirely different story taking place somewhere near Stygia. More on Marvel's ADHD issue below. Most of the story emphasizes Conan's unique abilities (huge size, quick thinking) to work his way out of a terrible fate; a chance, and unnecessary, lightning strike detracted from Conan’s ability to solve his own problems. The primary antagonist introduced in #1 was the Crimson Witch and her minion children; they appear again, this time for 2 pages (in No.2 it was ~1page). I'm hoping No.4 allots them more emphasis. On the Black Starlight front, John C. Hocking dishes out another chunk of Conan and his mysterious travels to Stygia with the emerald lotus. This story starts to take shape now, so I am interested in seeing what his mission/goal is really about. Marvel's ADHD: Marvel's Conan the Barbarian is done well, but with the frenetic coverage of location and times in just three installments, plus a disconnected story attached, the apparent lack of focus is a concern. - AND there is another pastiche novelette to be placed in The Savage Sword (penned by Scott Oden). 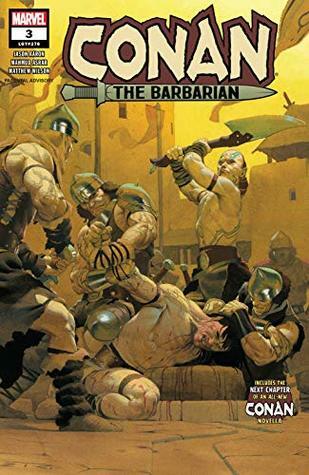 - Let us assume that The Age of Conan has a story too... that would mean that Marvel is giving readers ~6 separate Conan yarns nearly simultaneously, the first two of which is jumping across geographies and time. I only hope that there is some sort of coherent theme across these. Twilight Echoes #1 Review by S.E.